Compliance training is one of the most critical aspects of our jobs as learning and development professionals. It’s the area that can result in the most negative consequences. Yet, it’s often neglected. It’s understandable – it’s not exactly the fun and glamourous sector of instructional design. But it’s still important to keep from neglecting it. Here are some ways you can tell if compliance training is too far on the back burner. 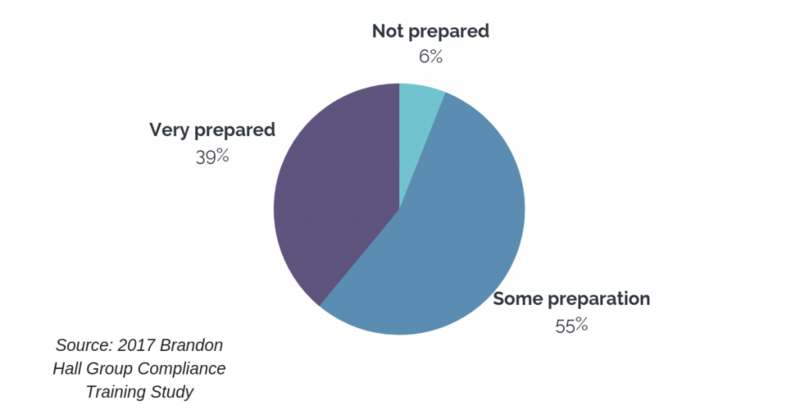 According to Brandon Hall, only 40% of companies are thoroughly prepared for a compliance audit – making 60% less than prepared. It’s amazing that so many companies risk it when the consequences of failing a compliance audit can range from fines and lawsuits, bad public perception, reduced revenue, to reduced employee morale. You may feel unprepared for a compliance audit if you don’t distribute training consistently or have disorganized records. If you’re not sure how often your employees have taken the training, it’s easy for compliance to lapse and for learners to be behind the legal compliance rate. If you feel overwhelmed when you think about compliance audits, it may be time to consider adjusting your strategy. Make sure you invest in learning management software that makes it easy to track employee training and conduct recurrent training. Those feelings of being unprepared for a compliance audit will go away when it becomes as simple as clicking a button to retrieve employee data and check that everyone is up-to-date on training. 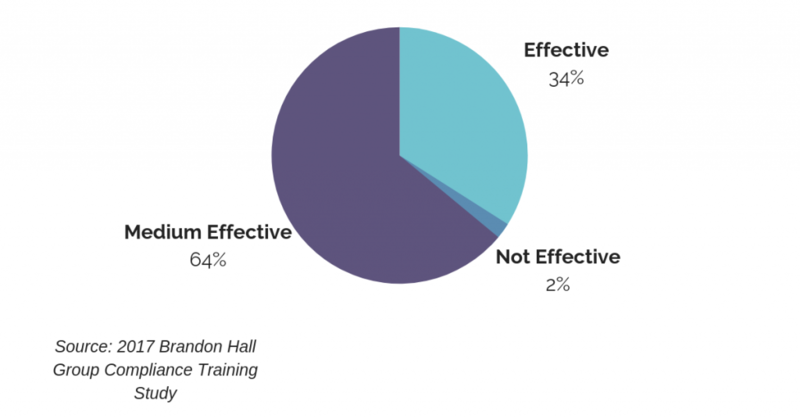 Brandon Hall’s research found that 61% of companies rated their compliance training as only “somewhat” effective. Companies who can’t confidently say their training is effective are clearly not meeting their compliance training goals. 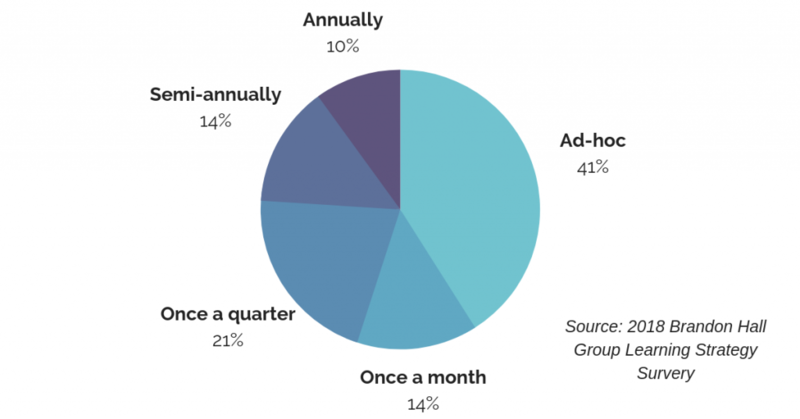 And if the training isn’t meeting goals, then it puts the company at risk for some of the consequences mentioned above – lawsuits and a poor reputation. The company culture around compliance is the foundation for everything else. At many companies, compliance is merely a legal box to check and are only going through the motions. Employees can sense it, and they will only go through the motions too. There’s no way compliance training can positively impact performance if people are unengaged and do not care. If you’re not sure where to start with making your compliance training more effective, it may be worth consulting a professional instructional designer – especially one with a lot of experience in compliance. It’s also a great idea to lead by example. Start conversations about compliance and make it a part of the process during projects and tasks. Your employees will follow your lead. If you only ask your employees to think about compliance once a year, they will only think about it once a year, too. 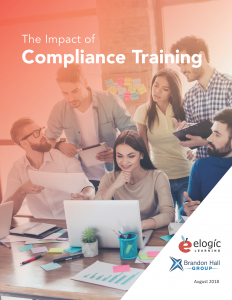 Brandon Hall research suggests that 10% of companies only complete compliance training once a year. Learning is a continuous process, and that stands for compliance training too. Find ways to make it a part of the conversation year-round. You can even implement small ways of doing so, such as via microlearning. We have clients that have employees complete monthly safety modules, or who have implemented other similar programs. These modules are easy to distribute and track through the right LMS system. Asking people to go over safety rules or emergency procedures one time and then expecting them to be able to effectively use it in six months, a year, or more than a year without review is unrealistic. Great, effective compliance training is one of those things that people don’t notice until it’s not working. It’s taken for granted until something goes wrong and someone fails to follow a safety procedure, or until a company is about to get audited and they’re scrambling to get their records together. When compliance training is being developed, the focus is often on the negative impacts and what the company is attempting to avoid. This includes accidents, fines, and legal issues. But a well-developed compliance program focuses on the positive impacts, as well. We see this time and time again: companies who believe in professional development and provide their employees with excellent up-to-date training, but keep using outdated legacy courses related to compliance. Compliance is the one that no one likes, the outsider that isn’t considered a part of professional development the way leadership skills or six sigma might be. As a result, sometimes attention to compliance wanes in comparison to new, more exciting types of professional development. If you know in the back of your head that your compliance training doesn’t really match the other training you provide, it might be time to revisit the way you approach it. Remember – compliance training is often the first training that an employee receives when they start at your company. It makes a first impression of how much your company cares about their employees. Compliance training is a unique opportunity to make a good impression and show your new hires where your priorities and values are as a company. Overall, it’s a good rule of thumb to make sure that your compliance training is well-integrated into the rest of your strategy and that you make decisions that help foster conversation and workplace culture around compliance. Find ways for it to be a part of the everyday lives of your employees, and track its effectiveness over time. Most of all, find LMS software that keeps compliance in mind and makes it easy to maintain records and be prepared for an audit. Learn more about the impact of compliance training and how it can change your company for the better. Understand the different methods of compliance training and learn how to identify opportunities within your company.